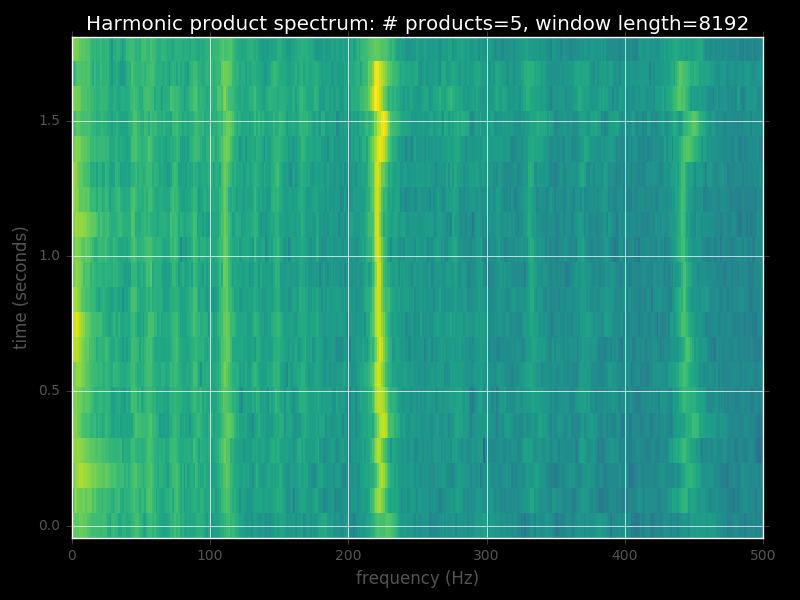 Pitch (fundamental frequency) detection using (1) harmonic product spectrum, (2) Blackman-Tukey spectral estimator, and (3) Welch spectral estimator. 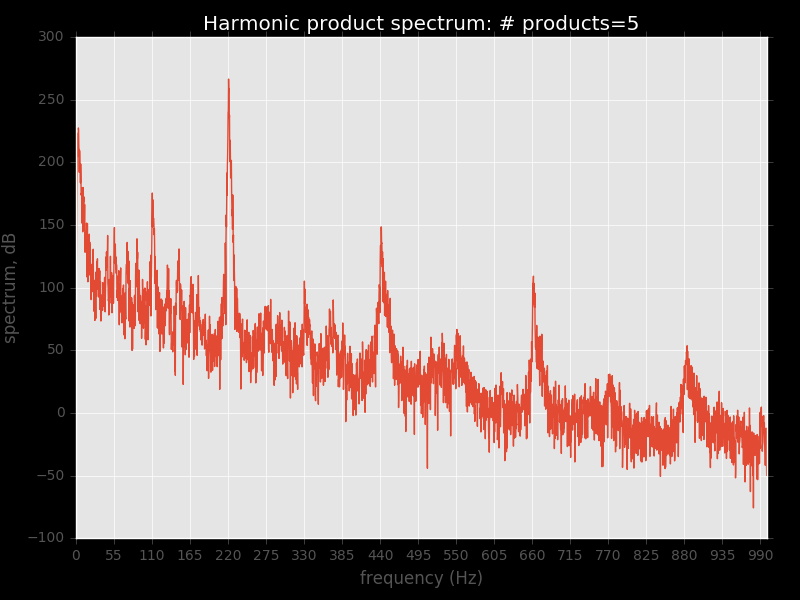 See the question and discussion on StackOverflow: How to get the fundamental frequency using Harmonic Product Spectrum?. 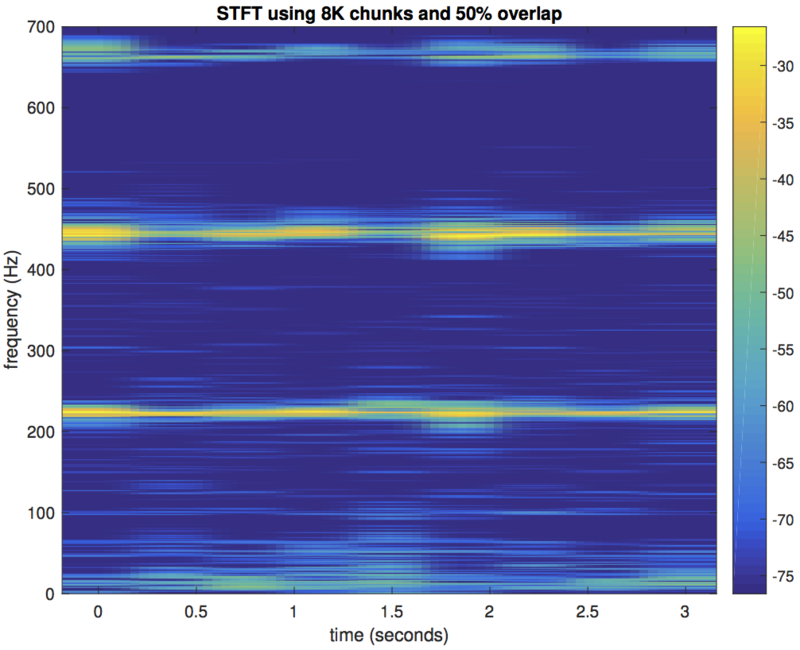 In their Spectral Analysis of Signals, Stoica and Moses cite the Blackman-Tukey spectral estimator as a generalization of many other spectral estimators, including the Welch estimator and the periodogram. It is parameterized by a window, whose length and shape governs the characteristics of the spectral estimate, specifically, its variance (how up-and-down the plot jumps) and its resolution (how wide the peaks are). Here’s the Blackman-Tukey spectral estimate of the entire audio clip using an 8K Hamming window. The code to generate this is below. As with the Welch estimate (see below), the Blackman-Tukey estimate does not attenuate the 440 Hz harmonic as much as the harmonic product spectrum method above. 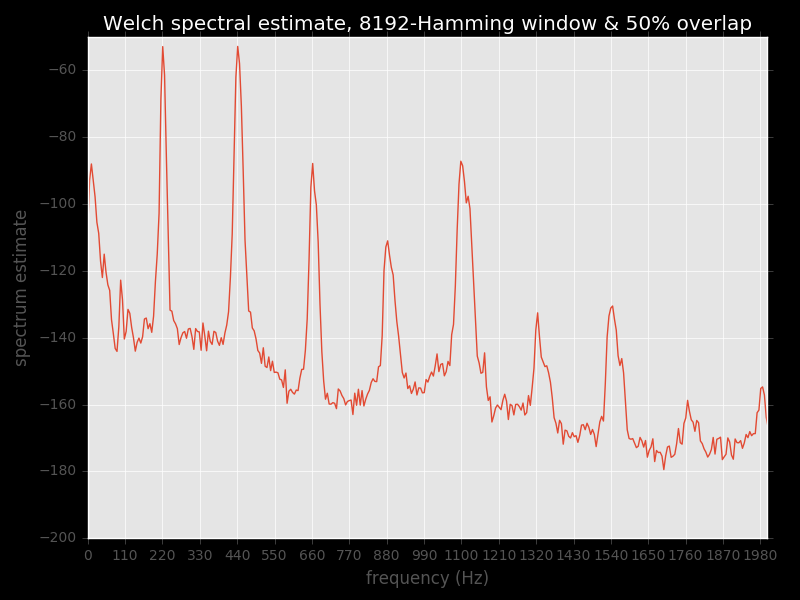 Uses scipy.signal.welch to estimate the power spectral density. Again, in contrast to HPS, Welch’s method as well as the short-time Fourier transform below both leave the 440 Hz harmonic at almost the same level as the 220 Hz harmonic. Stoica and Moses describe Welch’s method as an approximation to the Blackman-Tukey estimator that can be efficiently evaluated using the FFT. 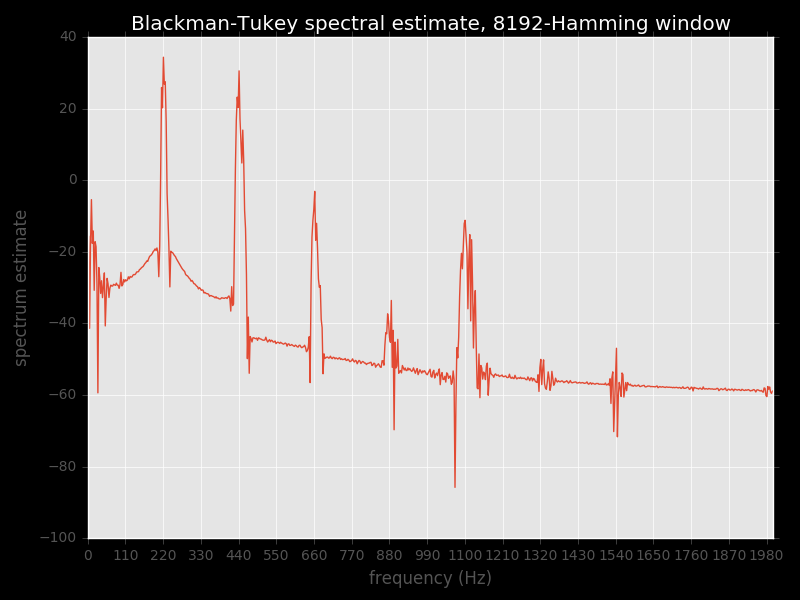 Even though I tried to match the parameters to the Blackman-Tukey example (8192-bin Hamming window), the two spectral estimates are quite different, even qualitatively (compare peak at 880 Hz). # Convert both raw samples and sample rate to floats, then convert stereo to mono. """Apply a function over overlapping sliding windows with overlap. overlapping between chunks. Optionally apply a function to each such chunk. Any chunks at the end of x whose length would be < Nwin are silently ignored. Iterator (list, vector, range object, etc.) to operate on. Length of each chunk (sliding window). samples of a chunk will be the first Noverlap samples of the next chunk. and will just return the chunks. A list of chunks, with the function f applied. 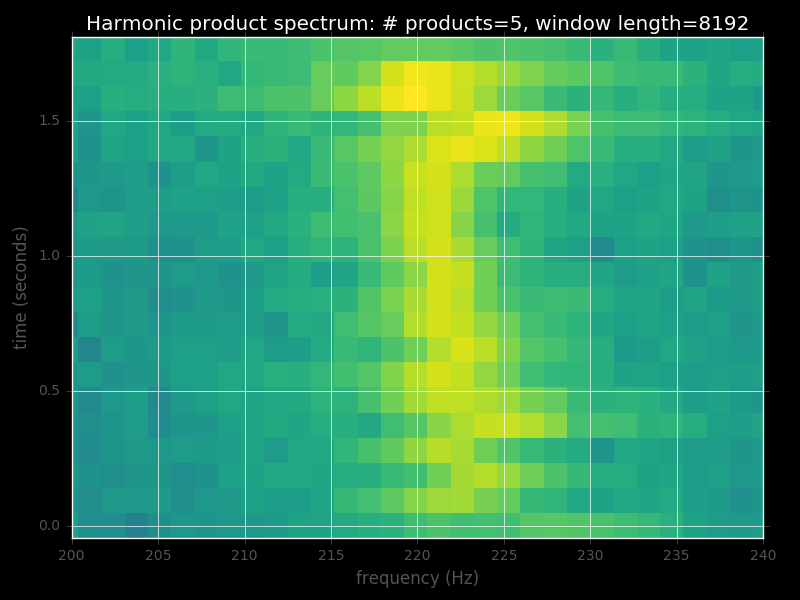 """Harmonic product spectrum of a vector. numProd) long, so at each step, we only consider this many elements. 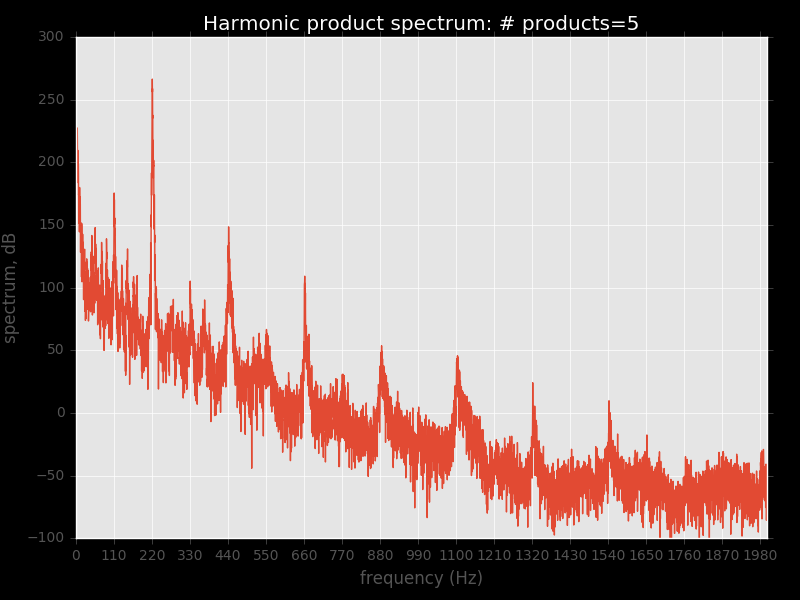 Number of products to evaluate the harmonic product spectrum over. prime while 4096 is a power of 2. Spectrum vector with ceil(Nfft / (2 * numProd)) elements. roughly (fs / (2 * numProd)) Hz. # Run HPS on winlen-long chunks of the data. """Convert evenly-spaced vector of sample locations to extents for `imshow`. Power spectral density estimate. Contains ceil(Nfft/2) samples. Vector of frequencies corresponding to phi. Matlab code. See http://user.it.uu.se/~ps/SAS-new.pdf for book contents. Code prefixed with arf. namespace is freely available, e.g., STFT function. For results with this algorithm, see the images attached to this gist below.